Successfully visited Heritage Key for the first time today. 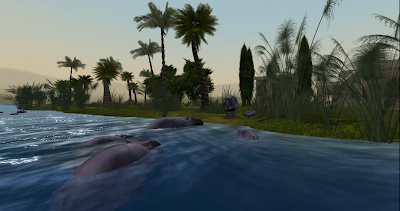 This is a new virtual world venture by the Rezzable people, run outside Second Life, but using Second Life technology. Avatars have been deliberately handicapped by being unable to build or create in world. I had been able to get in and set up an avatar before, but the teleportation didn't appear to be working when I had been there previously. I dislike the clothing, skins and hair which is provided, as I am used to much more sophisticated products in SL, and I particularly missed my animation override, as I hate walking like an SL newbie, because it always has been extremely jerky and badly done. 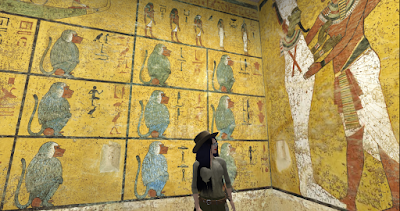 Heritage Key is in alpha testing (so it says) and purports to show you the treasures of the Tutankhamun excavation. When you walk into the teleport spiral, you end up in a gallery where you can pick up some slightly less awful clothes, and in the future will be able to buy things with points gained by answering quizzes. I somehow blundered to the compass point and found the balloon to travel to the valley of the kings. This isn't as impressive as it sounds, as the valley is just a few mountains and some gateways to excavations which are all apparently closed, except for the one for Tutankhamun. Even that one only seems to have a couple of rooms open to the public. There are a lot of things to click on, but these mostly seem to be audio clips of someone reading information in general about the Carter excavation or the Pharoah and not specifically about what you can see in the world. A lot of the things around the excavation site seem to be very skin deep scenery rather than interactive. There is a game to play, which infuriatingly advises you to take a pickaxe to the dig areas denoted by orange flags, and to dig for things - and then tells you off for doing that. In a few of the locations this gains you some (modern) objects that you would have had to pay good points for. This seems to lack logic - it would be a lot more fun if you found ancient artefacts that might be useful, like a lamp, jewellery or a clue to something else. In some of the designated pits it tells you that you have destroyed the artefacts by attacking them with a pick! I thought I would be able to explore the Carter dig, and to go into the tomb to see the things he found as he found them. In actual fact there is a strange teleport halfway down the tunnel to the tomb, and then only two rooms with a few artefacts able to be explored. 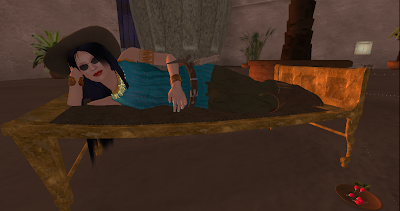 To see the sarcophagus and fabulous coffin of Tutankhamun, one has to travel to the gallery, which is laid out for all the world just like a real life museum, which seems to miss the point of having it in SL at all. There is a facility to enlarge the items in the gallery, but this immediately kidnaps your camera under the ground - not ideal for newbie visitors. Finally I travelled to the Life on the Nile area, but once again, this was laid out as a museum exhibit, instead of being the living example I was expecting. There were a few families of hippos and the odd crocodile, and a few desultory artefacts lying around on the river banks... a seat here, a bowl of eggs there and a basket in a few places. It would have been so easy to make the use of things clear by allowing visitors to sit on and activate them. I had been expecting cooking, fishing, farming, living to be going on in this place. Maybe a home of the time and place to explore with the living and eating areas. Instead of that I found a couple of wildlife tableaux and a shop for free clothing. Make no mistake, there are some breathtaking exhibits in this virtual world. There are some fantastic objects which are very close to the real life version, I imagine. But they are exhibits in a very old-fashioned museum sense, and don't - in my view - use many of the advantages of a virtual world in which *anything* is possible. nice post ;) . Yeah, we are working on the interaction part. Lots of work to get us this far using OpenSim and Drupal as basis for our grids. Hope to see you again!